white bass schooling - Lake Houston Fishing! white bass were schooling all day today. i will tell them where i saw the schooling activity . I normally fish somerville for white bass. How is lake houston on catching somw whites? I have to say I have tried spoons several times on Lake Houston and never caught a white bass. Was really starting to think they are just not there. 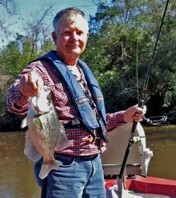 I went to Livingston last Sunday and must have caught 40, I kept 15 nice filet size ones. So I would love to find them schooling on Lake Houston. They do hang out on the main lake a lot off sandy points and humps. and white or chrome shad pattern cranks. Livingston does hold a lot of good size white bass around pine island , and dove island. and most of the river bends. the crippled minnows that the little white bass or injuring on top in the school.